Rob Roy MacGregor, the folk hero and Robin Hood of the highlands, is buried in the atmospheric churchyard of a Victorian parish church in Loch Lomond and the Trossachs National Park. A romantic 18th century figure, made famous by the work of two famous writers, he may be an example of the old adage that when it comes to fame, "There's no such thing as bad publicity." Unlike the legendary figure Robin Hood, with whom he is often compared, the outlaw Rob Roy MacGregor was a real man. He was born in 1671 near Loch Katrine and lived most of his life in the Breadalbane area of the Trossachs. Before he died in his bed in Balquhidder Glen in 1734, a famous novelist had used his colorful life to turn him into a legend in his own lifetime. A dispute over money and cattle led him into a life of banditry and cattle rustling aimed at local landlords and nobility. Later he took up the doomed Jacobite cause, supporting the deposed Stewart king, James II against the English Crown under William of Orange. Eventually, he was accused to treason and a price was put on his head. Daniel Defoe, the well known 18th century author of Robinson Crusoe was so taken with the stories he heard of Rob Roy's adventures and misadventures that he wrote a fictional biography of him, Highland Rogue. Later, after he was accused of treason, the book became so popular that it led to him being granted a Royal Pardon in 1726. He died of old age and is buried among the MacLarens and MacGregors in the graveyard of the Old Kirk near the Balquidder parish church. But it didn't end there. His name and fame grew even larger when the 19th century writer, Sir Walter Scott, embellished his story in the novel Rob Roy. Finding Balquhidder, near the head of Balquidder Glen, overlooking Loch Voil, is something of a challenge. Although it lies to the west of the A84, you have to leave the main road going east, between Strathyre and Lochearnhead, to find it. Look for signs for Balquhidder and for the Mhor 84 Motel and just before the hotel turn right under the A84. There is a small sign for Balquhidder and Rob Roy's Grave - but it is easy to miss. The road climbs and winds - and you will pass an old church on the left that looks likely - but keep going. Although only about a mile and a quarter from the A84, these are country miles and the ride take much longer than you might expect. Not to worry, the site is well signed once you are near it. 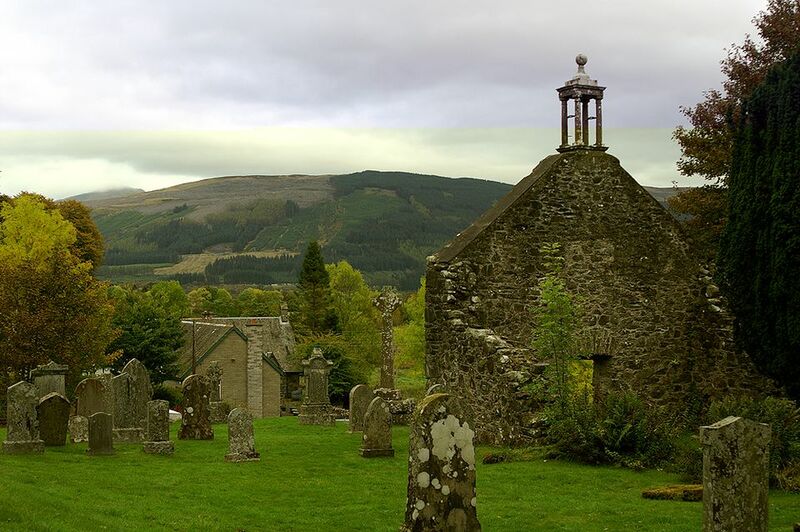 The Old Kirk, where Rob Roy is buried beside his wife and two sons, is beside the Victorian, Balquidder Parish Church. Behind the parish church, a steep path leads beside a rushing stream and then down into the glen beside Loch Voil, about half a mile away. The tiny parish (pop.50) has a library where there is a tea shop in the summer, and additional parking near the town hall, just past the church. Return the same way you came because the glen is a cul-de-sac. If you continue on in the same direction, the road becomes a single track, running alongside Loch Voil and tiny Loch Doine, then simply dead-ends. A curious monument stone stands at what appears to be the head of the graves of Rob Roy, his wife and sons. I say "appears to be" because all markings and shape have worn away from the graves themselves. The words "MacGregor Despite Them" are chiseled defiantly on Rob Roy's Grave. During Rob Roy's lifetime, the name and clan of MacGregor were banned by the crown - not because of Rob Roy's action, but because of an earlier dispute with the King in 1603. For a while, Rob Roy used Campbell, the name of his mother's clan. But once he became an outlaw and bandit, he returned to using the MacGregor name as a challenge to his enemies.